If heaven was giving out awards, I think I would be in the running for winning the award for “Biggest Kid”. After all, I’m five feet eight inches tall—that is a pretty big kid! Some of my best friends are children. I don’t have very many peers that like to goof off as much as I do—they are probably embarrassed to be seen with me! I like to load up my car with kids and go to the beach, go swim at the pool, go folk dancing, or go to the park. I turn the radio up nice and loud and sing at the top of my vocal capacity. I don’t wanna get a speeding ticket, but I really like to drive fast. What I do is “hug the turns” whenever possible and as fast as possible (while keeping safe, of course). It is so fun to make the kids squeal! As a result of hanging out with kids a lot, I get invited to their birthday parties. My favorite one so far was Angelina’s princess party. 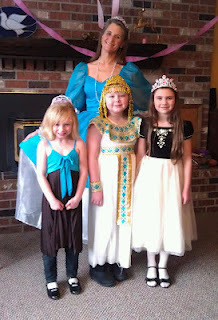 I am pictured here, dressed as a princess, surrounded by my little friends. I told you I was the biggest kid! I like to make people laugh. Laughing is SO fun and it is contagious too. One of my favorite scenes from a Disney movie is the one in Mary Poppins where they all start singing “I love to laugh—hahaha!” and they all float up to the ceiling. Wouldn’t that be fun?! Children laugh on an average of 400 times per day! Adults laugh like about 15 times a day. Whew--what a difference! I think I’d rather be a kid, wouldn’t you? If you listen carefully, children call adults “dolts”. So that’s what I’ve started calling them too. Hahaha! I’d rather be a kid than a dolt! Don’t you love the way children are full of wonder and amazement at the world? They chase butterflies, blow dandelion seeds and watch them float on the air, and they love to run and jump and dance around. I love to go swimming with kids and play games in the water. That’s a blast. I like the way kids will get enthusiastic about things too. Why do we have to be so dang reserved all the time? To be childlike is to be more trusting and loving and spontaneous and honest. I teach a children’s dance class and my students never cease to amaze me at how loving they are. They run over and hug me and tell me they love me. They skip and frolic around with carefree abandon. I want to be more like that. Yesterday one little girl told me, “I like your colorful blouse, but I don’t think it matches your twirly skirt very well.” Hahaha! That made me laugh! Kids are so honest. They tell you when they like something and when they don’t. When I was a girl I was often scolded for daydreaming. My hands would slow down at the task at hand—such as washing dishes, folding laundry, or doing a math assignment. Instead I would stare off into the distance, lost in my dream world. I wrote creative stories about make believe lands and enjoyed reading and daydreaming about what it would be like to be one of the characters in the book. Even now, at age 54, I like to dream. You’d think I would have grown out of it by now, wouldn’t you? No, I like to dream about all the possibilities in life, such as where I’d like to travel and what I’d like to do. The Bible says, “Nothing is impossible with God.” We have an unlimited God and so we need not limit ourselves or our lives either. Germany Ministry Trip, EXCITING Update! Update on My Book, "Shall We DANCE?"